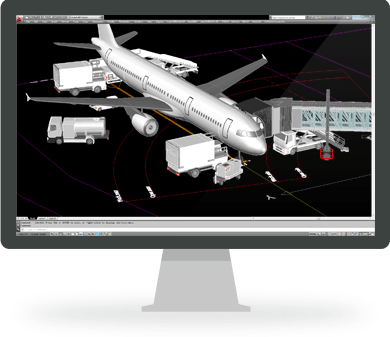 The leading software package for airport airside planning, design and operations. Advanced aircraft maneuver simulations and visualization. With renowned market-leading technology at its core, AviPLAN delivers a unique feature-set tailored to meet the specific challenges faced by today’s airside planning, design and operations professionals. AviPLAN delivers a unique feature-set tailored to meet the specific challenges faced by today’s airside planning, design and operations professionals. Working with AviPLAN's comprehensive, highly accurate specifications library of aircraft, ground support vehicles and passenger boarding bridges means less time sourcing information and more time producing results. AviPLAN’s powerful features allow users to define and adjust aircraft maneuver and stand planning parameters "on the fly" - ensuring that tasks that previously took days or weeks can now be done in hours or even minutes. AviPLAN is compatible with all the major CAD platforms most recent versions including: Autodesk® AutoCAD®, Bentley® MicroStation® and Bricsys® BricsCAD®.